Submit a review of the international moving company you used (it only takes a minute). GoodMigrations reserves the right to request proof of your international relocation and use of a mover. Moves in which a postal service, DHL, FedEx, UPS, or a similar service were used are not acceptable. Move must be from one country to another and have occurred after January 1, 2010. The move must have been completed by the time of your submission. You cannot have previously submitted a review on GoodMigrations. The contest deadline is 11:59 PM, Hawaiian-Aleutian Time, September 30, 2012. The winner will be selected via Random.org on or about October 2, 2012. The winner will receive 10,000 frequent flyer miles from the eligible airline of his/her choice (airlines listed below). If you’re not into the whole frequent flyer thing you can substitute a USD $250 Visa Prepaid gift card. If the winner does not reply within 7 days of being selected, another winner will be selected via Random.org. Arrangements will be made with the winner to deposit the miles after the winner has been selected and successfully contacted. The winners can select the 10k frequent flyer miles from the following eligible airlines: American Airlines, Delta, USAir, United, Copa, Alaska Airlines, British Airways, KLM, Lufthansa, Swiss, Brussels Airlines, Austrian Airlines, or any other Miles & More program participant. To receive the miles the winner must have a frequent flyer account with the airline of choice. 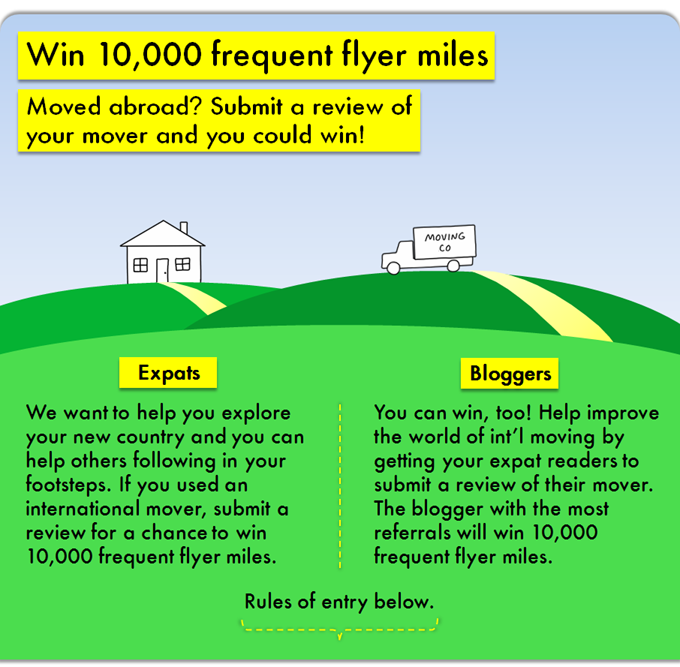 The blogger who refers the most people who submit reviews will win 10,000 frequent flyer points from the eligible airline of his/her choice (eligible airlines are listed in rule 12 above). If you’re not into the whole frequent flyer thing you can substitute a USD $250 Visa Prepaid gift card. Bloggers may both submit a review of their own move provided it meets the criteria above and refer others to review their moves, but cannot win both for submitting a review and for referring the most people. For example, a blog named “Expat in Madagascar” would have readers click on http://goodmigrations.com/?review_your_move=1&ref=ExpatinMadagascar to get credit for any submissions. The winner will be selected on or about October 2, 2012. If the winning blogger does not reply within 7 days of being selected, the blogger in second place for the number of referrals will be named the winner. In the event two or more bloggers are tied for referring the most people, the winner will be chosen via Random.org. If you’d like to include some information about GoodMigrations in any posts/tweets, a short description that can be used is pasted below:GoodMigrations makes it easy to find international movers, read real customer reviews of those movers, and request free quotes from the ones you like. GoodMigrations also offers a free, step-by-step guide on the moving process so you know how to protect yourself. The company was started by Adam Vagley and Sharon Laufer after their own struggle finding a reputable mover when relocating from New York City to Sydney, Australia. Site terms and conditions apply. If you have any questions, please contact Sweepstakes@GoodMigrations.com or find us on Twitter at @GoodMigrations.